One of the most interesting temporal anomalies in fiction is that set up by the Terminator movies. Given the excessive number of trips through time which are made, we would expect the entire timeline to totally incohere and become impossible; yet with a few simple extrapolations, it all fits together. If we can find the beginning, we can trace the thread of time as it weaves forth and back. So we consider the timelines of Terminator. The first movie presents a story in which a robot from the future comes back in time to kill the mother of an as-yet-unborn rebel leader. During the course of the movie, the child is conceived, as son of a man he has sent back from the future to protect his mother; the robot is destroyed and the father killed. The patent absurdity of this immediately presents itself: the birth of the rebel leader is dependent upon his adult self sending his father back in time to meet his mother. Most reasoning adults would immediately write this off as impossible. However, in studying the patterns of temporal anomalies, we discover a form elsewhere referred to as an "N-Jump", which, properly understood, resolves this difficulty. In an N-Jump, time extending from the past reaches point A, the point in time to which a traveler from the future will return, and beyond to point B, the point from which the traveler leaves for the past. During this segment of the time line, no changes have been made; it is the original unaltered sequence of events. When our traveler leaves point B, that time line ends--the history based on the A-B segment cannot progress, because the instant the traveler reaches point A, it is changed by his presence, and is re-named point C; this creates an alternate C-D timeline, with D being the same point in time as B. If at point D, the traveler can and does return to point C with the same intentions, history is able to continue into the future. This is an N-Jump. If upon reaching point D, there is any reason why the traveler cannot return to point C, or if there is no reason for him to do so, the result is an infinity loop: the original A-B segment is restored, ending with the return to the C-D segment, reverting to the A-B segment in a perpetual cycle. In this case, there is no future beyond the time represented by points B and D.
The N-Jump provides the solution to the absurdity of the first Terminator movie. It suggests that this is not the original timeline, but the altered timeline. Although the story of the original timeline has not been told, a substantial amount of it can be reconstructed. In the original timeline, Sarah Conner's life was fairly ordinary. Very near point A, she met a guy unknown to the altered timeline; he is the necessary original father of John Conner. So little remains of this timeline that almost anything is possible. John Conner might have had a different name, if his mother married. He might in this original timeline have been a girl. One thing is certain: when the war came, Sarah Conner's child was a thorn in the flesh of Skynet. Of course, Skynet also must have been created in the original timeline, or there would be no war. However, the details of this creation are unknown, as will become clear as the thread unravels. Sarah Conner's child is a major problem for Skynet, so the computer devises the ill-considered plan of sending a machine into the past to destroy Sarah Conner before the child is born. It is important to recognize that this is point B; nothing done after this moment follows from the same history. That gives us information about the C-D timeline, because we know that certain things did not happen. Of first importance, we know that the birth of Sarah Conner's child still occurred, because had that not happened, no one would have been sent back to protect her. In fact, had the Terminator successfully prevented the birth of that child, then the Terminator would not have been sent back (at point D), and the original timeline would have been restored, forcing the world into an infinity loop. However, something must have happened which John Conner needed to change; otherwise, no one would have come back to protect Sarah. The fact that John sends Reese tells us first that the Terminator failed, but second that something was dreadfully wrong. This is a difficult point. John must know that the Terminator failed, or he would not be alive. Sending Reese is a calculated risk; if it goes wrong, John may cease to exist. However, there is a possible reconstruction of this segment which solves the problem. Remember that when the Terminator reached the past, he began killing people named Sarah Conner. Perhaps Sarah became aware of this, and fled. It is still necessary that she have a child. It may or may not have the same father as the other. The Terminator, intent on its mission, pursues her, catches her, and kills her. Its simple logic tells it the mission is accomplished, and it finds a place to shut down. It does not understand the basic failure: John Conner has been born. The first N-Jump resolves, and there is a future. The grown Conner child doesn't like that future. He wants to save, not himself, but his mother. So he sends Reese back to protect his mother. Reese doesn't realize that the Terminator had to fail in order for this time line to exist; he thinks he's there to save Sarah's child. However, his presence drastically changes the entire timeline in several ways. First, he interferes with the birth of Sarah Conner's child, replacing the original father with himself. Second, he gives information to Sarah which she uses to protect herself and to prepare John to be a more formidable opponent. Third, he jump-starts the Skynet program. This third point will require some reflection. In the second film, we are introduced to Cyberdyne Systems, the company which created Skynet by studying parts from Terminator. However, in the original timeline, someone created Skynet, and it was most likely someone else, someone who was very near the technological breakthrough when, in this timeline, the system goes on line. So now the dates are all shifted earlier, and the company credited with the development has changed. This could create a minor loop. After all, it appears that the technology for Skynet is created sooner, preventing it from being created by someone else later. However, this is not insoluble if we recognize the creation of a brief sawtooth snap. The Terminators sent back by the original SkyNet may have been created by someone else, but as Cyberdyne takes over that technology those in the next timeline are built by them and sent back at the same point in time to do the same tasks, but with a different memory of their constructions. Reese succeeds in saving Sarah's life. Normally, this would create an infinity loop, because the reason for sending Reese back is gone, so he wouldn't be sent back. But this new history gives birth to the John Conner we know, and he knows from his mother that Reese is his father, and that he saved his mother's life, so this John has a different reason to send Reese back. It is this segment which is shown in the first movie, and which forms the history for the second. This timeline still brings the war, and John and Skynet are still primary combatants. The computer, still not comprehending the hazards of attempting to change history, sends a more advanced Terminator back, this time to kill John. Remember: that instantly changes history. No one can remember a past in which that Terminator did not return. There is therefore an altered time segment again lost to us in which the T-1000 tried to kill John Conner and failed, but which John Conner felt it vital to alter by sending the first Terminator model back to protect himself from a machine which he knew from his perspective had already failed in its mission. Let's reconstruct it. As unlikely as it seems, John Conner must manage to evade the T-1000 with the aid of such friends as he can find. The T-1000's backup plan was to capture Sarah, to use her as bait in his effort to catch John. John doesn't take the bait; he recognizes that his one hope is to survive. His mother, perhaps aided by police or military authorities, manages to destroy the T-1000 before it reaches John. However, she dies in the process. Thus at the end of this altered timeline, John determines once again to save his mother. Only the stakes are higher. If in sending help for his mother he opens the door for the Terminator to kill him, he has lost everything, even time itself. So he sends the original model Terminator back to protect himself, knowing that as a boy he would have saved her if he could have, and knowing that if he succeeded he would know that he saved his mother because he sent the Terminator back, and so would do so at the right time. The future is preserved. Unfortunately, Sarah doesn't realize the complications of temporal anomalies. She thoroughly questions the machine, discovering how Skynet comes to be. No one realizes that all of this information is based on a time line which has been altered not less than five times from the original. All of the critical facts have changed. Relying on this information, Sarah Conner destroys all trace of the Skynet project at Cyberdyne, and (with a lot of help) both Terminator machines. She believes that she has stopped the war. She has not stopped the war. She has merely created a new timeline. The company which originally invented Skynet will now invent it on the original schedule. The destruction of Cyberdyne and the original terminator will only shift the construction of Skynet back to its original timetable, unknown to us but undoubtedly slightly later. She may have also changed her information. In this timeline she by destroying Cyberdyne has thrown Skynet back to the unknown company, but the sequence is again fforced to repeat itself. Just as in this timeline the Terminator has no knowledge of the company who would have developed Skynet had Cyberdyne failed, so too the Terminator who returns at the end of this link would know only that Sarah Conner destroyed the wrong company: it was not Cyberdyne but its competitor who created Skynet. Here our story halts. We are in the second leg of our fourth temporal anomaly. To review, the first terminator killed Sarah after John was born, creating an N-Jump. Reese saved Sarah, but jump-started Skynet, creating a second anomaly, but because at the end of the second leg of this anomaly John sends Reese back not to save his mother but to become his father, and information flows in a circuitous manner from the future to the past to the future, this becomes a sawtooth snap resolved into an N-Jump escape. The T-1000 returns and, unable to kill John, instead kills his mother, creating a third anomaly, also an N-Jump. The fourth anomaly begins when the original terminator returns, ostensibly to protect John but actually to save Sarah; we are in the second leg of this anomaly. But this anomaly is going to become a problem, not because a person or a machine returned to the present, but because information did. The problem begins when Sarah Conner questions the Terminator about the future. Changes begin to occur when Sarah Conner begins to question the Terminator regarding the future, because she in the segment we saw has changed that future, and so the machine's information regarding its past should be different. According to its version of the future, Sarah Conner attacked and destroyed Cyberdyne Systems, for no apparent reason. John Conner knows this; he knows it was based on information from the terminator which for some reason proved incorrect. Another company, the company which built the terminator, was responsible for the development of Skynet, which went on line at a date later than Sarah expected. Sarah would probably, and foolishly, attempt to destroy the research at that other facility as well. This would be more difficult, since that is genuine original research, not based on the study of pieces of a machine from the future; therefore, it will be spread out, stored in pieces in dozens of separate databases throughout the company, duplicated in the files of several individuals in several departments. However, she is obsessed with stopping the war, so she will probably try. If she succeeds, an infinity loop is created--an extremely complex one. She is not only still in the C-D segment of the fourth anomaly, she is still in the C-D segment of every anomaly, including the first. If she stops the war, time is thrown back to the first segment, the segment in which she knew nothing and made no effort to stop anything, the segment in which she had a child of unknown name by a man not mentioned in the stories, and an unknown company launched a system called Skynet which became sentient and started a war to protect itself. All of time is caught in the loop. Let us hope she cannot stop the war. It doesn't matter whether in this segment she destroys Cyberdyne. If she destroys the other company, the original terminator cannot come back, therefore Cyberdyne cannot have the pieces of the technology from the future, therefore neither company can create Skynet, war is averted, and time is restored to the original segment in which war is inevitable: the loop occurs. If she fails, the original company continues on the original schedule. Cyberdyne is out of the picture, immaterial to the future. The war comes on the never-revealed original date, and the future is preserved. All that matters is that the war must begin, and Sarah Conner's child must survive to become SkyNet's enemy. 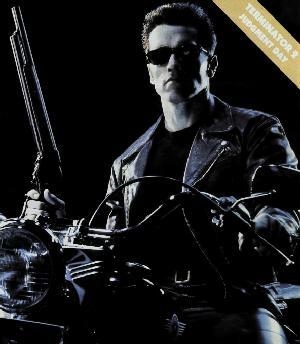 It is rumored that a Terminator 3 is coming. Let us hope the script writers consider the matter carefully. There are a few directions such a film could take. It is doubtful that they would attempt to present the C-D segment of the current anomaly; although that makes better temporal sense, it makes bad theater. Most of the patrons will have little understanding of the temporal anomaly created when Sarah used future information to change the future, and a reconstruction of those events with the new timeline will confuse most, bore most, and cost a great deal of money to re-create a story too like one already told. Yet to treat the C-D segment as the history which continues into the future would be equally faulty. Somehow the history of the A-B segment must be maintained in the C-D segment. There is one way to cause this: John must lie to his mother. His mother was attacked by a machine sent back from the future by Skynet to prevent his birth. This induced him to cause his own birth by sending Reese back, instructing him to protect his mother. His mother was locked up as insane, but when another machine was sent by Skynet to kill him, he rescued her, using the original machine which he sent back to do so. Both of those machines were destroyed, and Cyberdyne Systems was also destroyed, because the Terminator told them that Cyberdyne designed Skynet, and told them when the war would start. But it was another company which ultimately designed Skynet, and the war began anyway--but later than expected. Clearly, time has been changed multiply, and changing it again is not going to stop the war. John Conner may even realize that stopping the war would so convolute time that there would be no future. But at this point, if he does not send the terminator back on schedule, he has an infinity loop (a smaller one--only this last anomaly loops, as Sarah, being killed by the T-1000, fails to destroy Cyberdyne, so Cyberdyne beats its competitor to Skynet, so the events of the first segment recur). He will recognize that he must send the terminator back "to protect himself", in order to save his mother, but that it is necessary for the Terminator to give his mother the same--now wrong--information it gave before, so that she will repeat her previous actions. Therefore, he must program the Terminator with the wrong information, so that it will give Sarah the answers which preserve the timeline, not the answers which will stop the war. If he does this, the C-D segment is indistinguishable from the A-B segment, but that at the end of the C-D segment John will have to send the Terminator back based on his knowledge that the Terminator came back with specific information, and will have to repeat the process based on the previous time line. He can invade the past once more, this time taking the initiative to reach the past first. If a temporal recall device has been developed, he might even come himself. In this scenario, John, from a point in the future beyond all of the time travelers to date, devises a way to build a weakness into Skynet. In order to win the war, he must return to the past and penetrate the systems of the company which ultimately develops Skynet. At this point he must create the flaw, a weakness which will be undetected by the developers, and which will not prevent the war or any of the temporal transits previously made, but which the rebels can use after he leaves for the past to end the war. While he is in the past, he must give to his younger self the secret, but in a form which the young John cannot fully comprehend until he reaches the same point in the future. Thus, John will understand that a weakness exists in Skynet because he went back in time and put it there, and that that weakness must not be accessed until after he goes back in time, or time is lost. This creates a simple N-Jump, at the end of which the rebels will be able to stop Skynet by accessing that weakness. To keep it in harmony with the other Terminator movies, we should suggest that, in the space of time between John's exit to the past and his ability to stop Skynet, Skynet sends another Terminator into the past, this time to destroy the older John before he can effect his change; a more sophisticated machine, it will recognize that it can win by killing either John, and that it can use John's mother as a bargaining chip as long as it has her alive. This will give us the full action of the previous terminator movies. However, the younger John cannot be killed without creating an infinity loop, and the older John must finish the work and return to the future to take advantage of it. There are a few other possible scenarios for the next anomaly; however, I have seen none which afford a clean temporal resolution and contain sufficient action to be worthwhile as a movie.